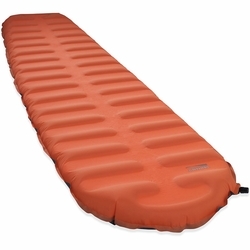 Therm-a-Rest EvoLite Plus Sleeping Pad. The four-season counterpart to the revolutionary EvoLite mattress adds ThermaCapture technology to deliver the comfort of air, the convenience of self-inflation, and the warmth you need for any season. If you’re looking for the best value in ultralight, backpacking mattress comfort and convenience, look no further. The EvoLite Plus mattress’s patent-pending AirFrame™ construction is the foundation, using alternating channels of foam and air to combine amazing compressibility with easy self-inflation and a stable, high-loft comfort not found in most air mattresses. In addition, this is Therm-a-Rest's first self-inflating mattress to utilize patent pending reflective ThermaCapture™ technology inside – yet another Therm-a-Rest first – boosting warmth with virtually no added weight or bulk. It delivers all of that while remaining light enough to satisfy anyone looking to move with a minimum through the backcountry. Stuffsack included. 2.5 in. (6.4 cm) of Loft: The best thickness-to-weight ratio of any self-inflating mattress. Ultralight AirFrame™ Construction: Alternating foam and air channels allow us to drastically reduce weight and packed size while maintaining loft. Supportive Atmos™ Foam: Exclusive Atmos foam is poured in an atmospherically-controlled chamber, allowing precision control over uniformity and loft. The result is the lightest and most compressible foam on the market. ThermaCapture™ Technology: Reflective layers inside help reduce radiant heat loss, boosting warmth with virtually no added weight or bulk.